If you have not been to the MET before, just know they have a suggested donation of $25 per person. You can pay whatever you feel like. 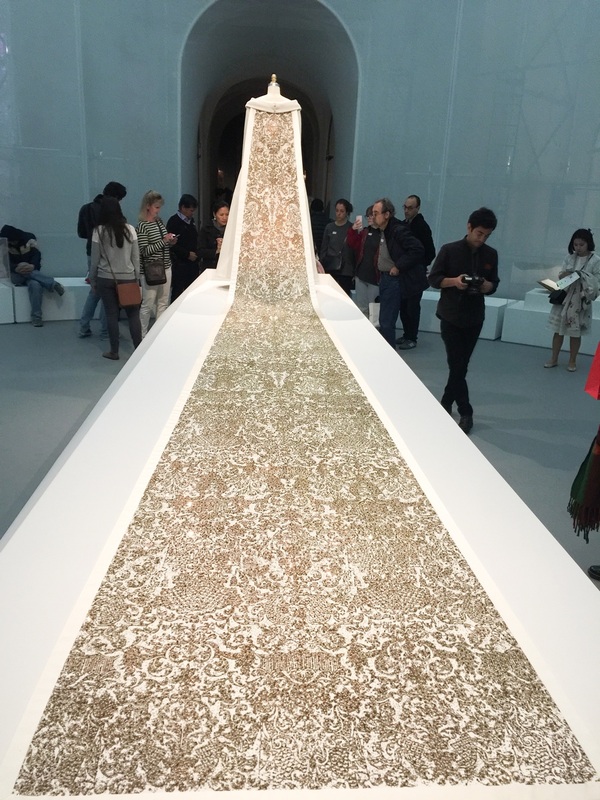 The Manus x Machina exhibit is two levels and is a pretty extensive one. Give yourself at least 2-3 hours to get through it all. If you can, go on a weekday before noon. Less people crowding around all the pieces so you can actually look closely and read the text. I arrived around 1pm and left around 3:30pm on a Thursday afternoon and the crowds to get in were pretty intense. Can't imagine how the weekends will be. The Manus x Machina exhibit is located in the Robert Lehman Wing, directly in the back of the museum. Basically just head straight back. The gift shop for this exhibit is downstairs and the exhibit flows in a circle, so if you skip over it, you can easily circle back around to it. If you don't already, after seeing this exhibit, you will have true respect for fashion houses and the designers who bring their visions to life via their creations. Exhibit is made possible by Conde Nast and Apple. WOW...Just WOW. Simply mind blowing. The Manus x Machina exhibit deeply resonated with me because having worked in fashion and then seeing the growth and influence of the tech world in fashion brings my professional life full circle. Case and point, the Hermes x Apple Watch Collection. Enough said. If you would have told me that this luxury brand would one day partner up with the once dorky computer brand for one of the most coveted item around, I would have told you that you were losing your mind. Enter the newest exhibit for the MET talking about fashion in the age of technology organized by the Costume Institute in the Robert Lehman wing. Upon entry you will find yourself being lulled by hauntingly beautiful music along with the sight of a shimmering 20 foot embellished train. Undeniably the most photographed piece, front and center, is the Chanel Wedding ensemble with the train designed by Karl Lagerfeld in 2014, which took over 450 hours of workmanship to complete . Surrounding this is a circular hallway of over a dozen designer pieces that exemplify craftsmanship such as artificial flowers, embroideries and featherwork. 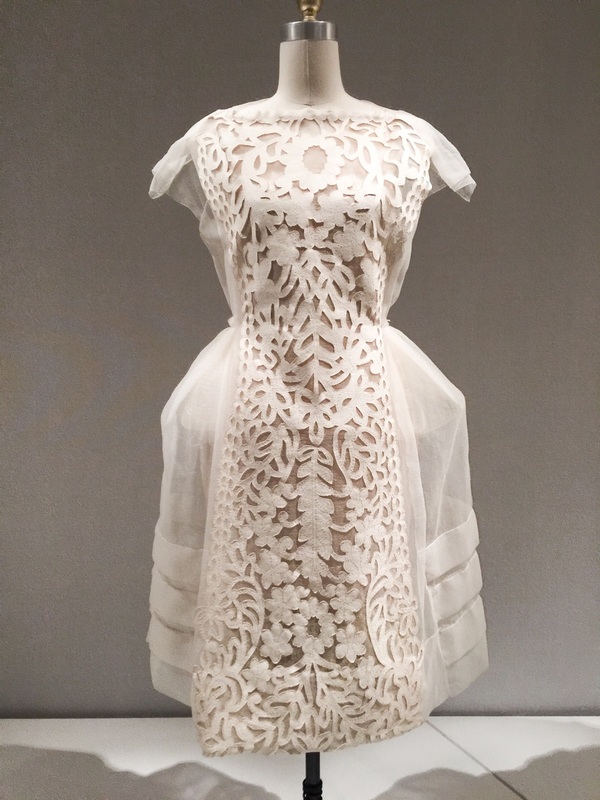 Hauntingly beautiful music playing in the background Moving downstairs you will find work that embrace lacework, leatherwork, 4D printing and pleating. The signage does an amazing job of explaining the difference between "Haute Couture" and "Pret-a- porter" the the way garments are produced. The exhibit describes and presents the idea that hand and machine are equals in the forward movement of the fashion industry. I won't get into crazy detail because lets be honest, I'm not going to tell you I know all of the history behind all of the creations at the fashion houses and blow your mind with my extensive fashion knowledge. But I will share with you my favorite pieces and some incredible quotes from the designers and hopefully inspire you to experience the exhibit for yourself. Below: Made from 100's of vertically aligned drinking straws, one in black, one in clear. This is the type of exhibit that needs two different visits; the first to go in to soak it in, the second time possibly with a specified guide to explain more of the back details of all of the garments, especially the ones on the downstairs level. Stay tuned for my time with Museum Hack in which I will return to the MET for a private after hour tour, but for now, go see the exhibit, enjoy and prepare to be blown away! Of course I wanted to include some of my favorite look from this years MET Gala. Can we say #showstoppers? See a pattern in gown style here? Full skirts are my jam! For more red carpet coverage, check out Vogue's roundup. Newer PostCOME JOIN ME: PLAY LIKE A KID AND PARTY LIKE A GROWNUP!